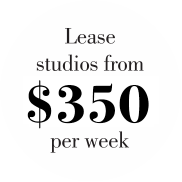 Lease studios from $350 per week. Have the freedom and control to grow your unique brand in your own space. Our ready-to-move-in boutique studios can be tailored to suit a range of businesses, from hairdressers, barbers and beauty specialists to those offering allied health, creative or professional services. Run your business your way with Fifth Avenue Lifestyle! Open your dream salon with minimal expense and stress. Deliver a private, supportive client experience your way. Fifth Avenue Lifestyle offers a practical alternative to traditional workspaces, with bespoke studios that cater to a range of industries and professions. Maximise your client base, take control over your career trajectory, and enjoy all the benefits of running your own business, your own way. You can choose how you work, enjoy the flexibility of setting hours that suit both you and your clients, and work autonomously or alongside a community of like-minded professionals… in one of five easy-to-access locations! Every small business owner deserves a modern, easy-to-access location where they can service their clients without the stress and expense that often comes with a job in a traditional workplace. Kick-start your dream career sooner, or work on growing your current business in a supportive environment that will help you to achieve a true work/life balance. Fifth Avenue Lifestyle offers flexible workspaces with high quality industry-specific fit-outs that can be customised to your own individual needs and that will reflect your own unique style. Georgia Kilpatrick – Face Australia Co, Albion. Discuss your needs and goals with a Fifth Avenue representative and transform your ‘what if?’ life goals into a ‘what next?’ Get Started.